2 Bedroom Flat For Sale in Doncaster for Guide Price £90,000. 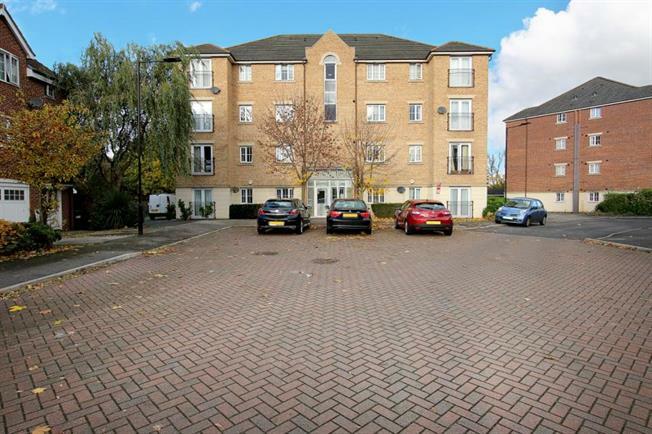 A well presented two bedroom ground floor apartment with open plan layout, en-suite to the master bedroom and allocated parking space! Accommodation in brief: secure communal entrance hallway leads to the front door and through to the inner hallway with doors to all rooms. The lounge is well proportioned and neutrally decorated with rear facing uPVC French doors and an archway leading through to the kitchen. Here is a generous range of wall and base units in light beech wood effect with rolled worktops above, inset stainless steel sink with drainer and mixer tap, four ring gas hob with integrated electric oven beneath and extractor fan above, with mosaic tiled splashbacks and tile effect laminate flooring. The master bedroom has a good range of fitted wardrobes with sliding mirrored doors and an En-Suite Shower room complete with low flush WC, pedestal wash basin with mixer tap and shower cubicle with tiled splashbacks. Bedroom two is a generous size with neutral decor. The Family Bathroom comprises 3 piece suite of panelled back with shower above, pedestal wash basin and low flush WC with complementary tiled splashbacks. Outside there are communal garden areas and an allocated parking space. The property sits at the head of a pleasant cul de sac in the ever popular residential area of Bessacarr. There are a good range of shops and restaurants nearby as well as reputable schools in the area. Excellent transport links into Doncaster Town Centre which is within 2 miles as well as great commuter links to the M18 offering an easy commute into nearby Sheffield, Rotherham and beyond.